Pork ‘n Pudding …. Christmas Dinner! 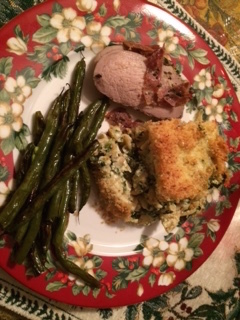 Delicious Christmas dinner of Prosciutto Wrapped Pork Tenderloin, alongside Spinach-Ricotta Noodle Pudding – thanks, Ina Garten, for both of these recipes from her new cookbook, Make It Ahead! You can do an Internet search to find a video link to Ina preparing this pork recipe on the Today Show. 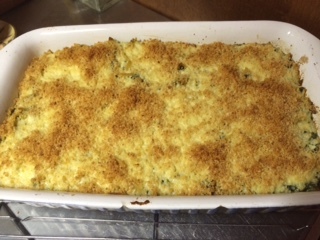 The pudding, Spinach-Ricotta Noodle Pudding, will become a holiday (Christmas) tradition in our house for years to come. It’s not something I’d make every day (because of the cream, butter, cheese, etc.,) but for that special holiday meal, it’s well worth this time and (a few extra) calories! 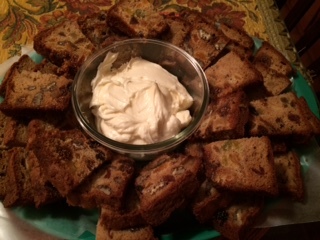 Since Ina’s latest cookbook is so new, this recipe isn’t published online, yet, but you can find it in her new book or check out any other number of recipe versions online. Like most of the dishes I prepare, I get ideas and inspiration from reading recipes – then move on to making it your own! As we wrap up 2014, I’m wishing each of you a healthy, happy, nutritious, and delicious year ahead in 2015! Thanks for following this food adventure along side of me, and I’ll look forward to sharing delectable delights in the year ahead! Fruitcake…. without the negative flashbacks! How many of you have avoid fruitcake at all costs? Nothing appealing about that wet looking cake filled with unidentifiable pieces of gelatinous fruit, right? This recipe will help to turn that image around, and will help you build a new set of tasty memories moving forward! Sicilian Swordfish: Pat dry, light olive oil, kosher salt, and pepper. Sear a couple of minutes each side on a hot grill. Remove to a platter, poke all over each piece with the tines of a fork, then drizzle lemon vinaigrette over each piece, cover with aluminum foil to rest for 5 minutes. 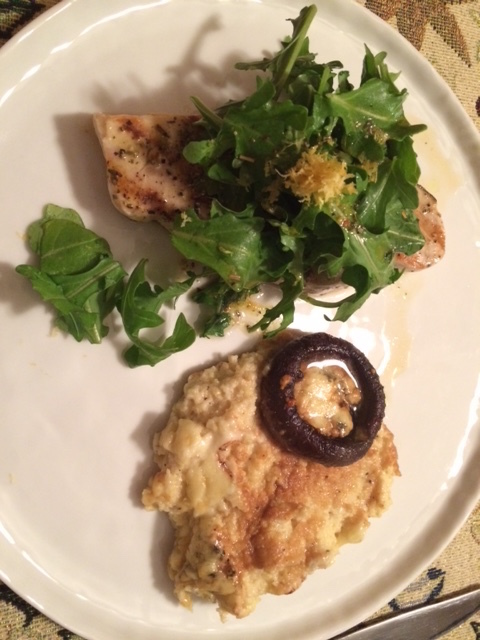 To serve – place one piece of swordfish on each plate, top with arugula, and drizzle with a couple of spoonfuls of the lemon vinaigrette fish sauce. Top with some grated lemon zest. Baked Polenta with Mushrooms and Blue Cheese: Start by cleaning (soft wet cloth) medium or large size Portobello mushrooms (6-8). Place on sheet pan (top side down,) drizzle with olive oil, balsamic vinegar, kosher salt, and pepper. Bake for 20 minutes at 400F until tender, then set aside. Bring 2 cups half-half and 2-1/2 cups chicken stock to a boil. While whisking constantly, sprinkle 3/4 cup fine cornmeal into boiling liquid. Continue stirring (almost constantly) with a wooden spoon until creamy consistency (6-8 minutes.) Off the heat, stir in 1/4 cup Mascarpone cheese. Pour polenta into a baking dish (medium size) and top with mushrooms (top side down.) Finish with 1/2 cup Gorgonzola cheese, sprinkled all over the top. Bake at 375F for 25-30 minutes until a bit bubbly and starts to turn golden brown. Let rest for a few minutes – and enjoy! This was my first attempt at making polenta at home – and aside from the constant attention to stirring (similar to making risotto,) it’s so easy. Once you achieve a creamy consistency, you could add in grated Parmesan cheese or any other element of flavor as you wish. I hope you’ll try one of these delicious recipes yourself. My point in sharing some recipes that aren’t my original creation is to provide pairing ideas, to let you in on easy delicious meals you can replicate in your own kitchen, and to open the door to your own creativity by starting with a published recipe – then making it your own! Buon Appetito!